I started ChemistCreative after I got laid off from Texas Instruments in 2009. I never thought of myself as an entrepreneur, instead, my parents had taught us to work hard in all that we do. To be fair and honest and to pay attention to the details. When I got laid off I was suddenly thrust into this unknown. I literally started working when I was 12 years old. I worked at a horse ranch making 2 dollars an hour for 20-30 hours a week. After that I worked at a Newspaper labeling papers and I cleaned the owners house as well. That job continued for over four years and when I turned 16 I started working for a gas station, then I was a teller at a bank. I cleaned the post office. I drove a special education school bus. During college I got a job working for Boeing making airplane electrical wiring harnesses. I paid for my education as I went and when I graduated I didn’t have any student loans. Yes, it took me 4 years longer, but I think I learned quite a bit while working through college. When I finally landed what I thought was going to be my lifelong career, I wasn’t prepared to find myself standing outside my office building almost 7 years later with a box of my stuff in my hands and an HR rep asking me for my badge and my work cell phone. This was unchartered territory for me. Because there were few jobs and I had already been doing some design work as a hobby I started my own web and graphic design business. I taught myself CSS and HTML, I got the Adobe Creative suite and started to learn Photoshop and Dreamweaver. I drummed up business with friends and realized in short order that even though I couldn’t always create great designs, I intuitively understood design. The last 8 years have been some of the hardest and best years of my life. I have literally learned how to be a graphic and web designer by using classes from Skillshare.com and Youtube. I started following great designers like Aaron Draplin and Dana Tanamachi. I was honing my skills as a designer, but what I wasn’t doing was honing my skills as a business owner. Since I started ChemistCreative out of necessity I wasn’t certain if this was the business that I wanted to do for a lifetime or if it was just something to do while I figured out “What’s Next?” As ChemistCreative began to evolve and grow I started to realize that I had something great here. I was good enough at design, marketing, analytics, etc to have a great freelance career, but how do I make the jump from owning a business that is really just a one man show to actually owning a business that I can sell ten years down the road? Right now I don’t own a business, I own a great job. I can’t sell this position to someone else. That is what the E Myth Revisited taught me. As I listed to the story of “Sarah” and her pie shop I started to nod my head as I realized that I could never continue growing this business if I didn’t take the time to work on the business and find other great designers who were already experts in their field. 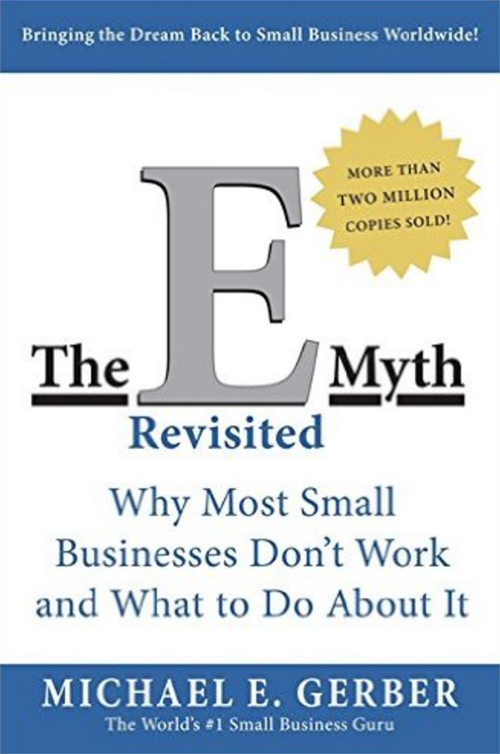 The E Myth Revisited is one of the best books I’ve read when it comes to running a business and creating a plan for transitioning from a freelancer to owning an actual business. One of the first strategies that Gerber outlines is to create an org chart and write job descriptions for each person that would hold that job. If you need a marketing director, account and a graphic designer then you first create those positions in an org chart and then assign yourself each role. It is your duty to fill these roles until you find someone else to fill them. Furthermore, you need to print out the job description and sign it agreeing that you are going to do that job and all that it details. To me this sounds like a lot of work and responsibility. It smacks of Adulting and Adulting is Hard! I don’t like it. But I think I’m at a good place in my business that it is time for me to start working on the business and try to find some employees. But before I do that, I need to write those job descriptions and create that org chart and decide what it is that I want ChemistCreative to be. For so long I’ve just worked on doing the work and that has got to change. The E Myth Revisited gave me a clear plan for what I need to do to make the leap from freelancer to business owner, I hope it helps you too. What business are you thinking about starting? What are some of your favorite books on business? I’d love to know. Drop me a line in the comments section!